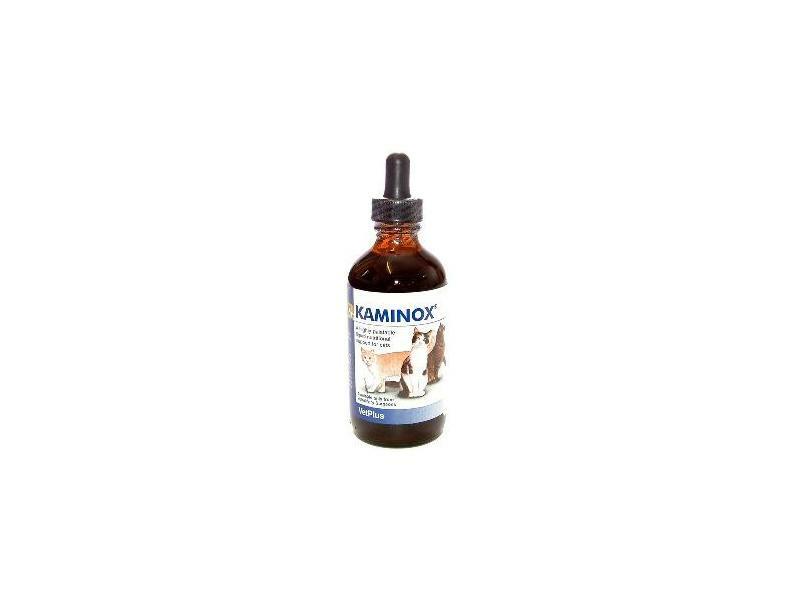 Kaminox is a palatable liquid supplement intended for cats affected by reduced kidney function and associated with a reduced blood potassium level. Increasing dietary potassium levels can have a significantly beneficial effect on cats with this condition. Kaminox is more readily accepted by cats than some alternatives and is designed to be given every day, directly by mouth or added to food. A palatable liquid nutritional support for cats with chronic renal failure or other disorders associated with low levels of blood potassium. Before you use this product PLEASE ensure you have had a diagnosis of low blood potassium from your vet. Contains 234mg Potassium per ml, with additional B-vitamins and essential amino acids for nutritional support. Kaminox Liquid can be fed directly or added to food. Administer 2ml per 4.5kg of body weight 1-3 times daily or as recommended by your veterinary surgeon. Consult your surgeon for appropriate levels for dogs and other species. Use with caution on cats suffering with cardiac disease. Do not administer to cats with diseases where high potassium levels may be encountered such as: acute or oliguric renal failure, hypoadrenocorticism, acute dehydration or urethral obstruction. Below are some recent questions we've received regarding Kaminox Potassium & Amino Acid Supplement for Cats, including answers from our team. this looks easy to give as its a liquid so can i give it to my dog with kidney failure? Yes, you can give this product to your dog. Depending on the degree of hypokalemia (low blood potassium) the usual starting dose would be about 2ml/5kg two to three times a day. You should check with your vet though if this would be a suitable dose for your dog. We have a 7 year old Norweigan Forest Cat that was diagnosed with CKD stage 2, about 2 months ago. He is also borderline Proteinurea and borderline anaemic. He has Semintra once daily to control the Proteinurea and approx once a month Vit B12 injection which does increase his appetite. And blood and urine tests every 6 weeks or so. Kaminox Supplement liquid has been suggested to us by friends. Can we administer Kaminox supplement to a cat taking Semintra? Do l need a prescription to purchase Kaminox supplement? be safe to give with Semintra? You do not need a prescription for Kaminox and it should be safe to give alongside Semintra- it may be very helpful. However unless your cat has low potassium levels when blood tested you should not give Kaminox. It is quite likely given your cats reduced kidney function that he will subsequently have a reduced blood potassium level but I would advise checking with your vet before starting on Kaminox. Could you let me know what dosage a 14 year old cat should have? Many thanks. The amount to feed is based on the cats body weight. The guidelines are to administer 2ml per 4.5kg of body weight 1-3 times daily or as recommended by your veterinary surgeon.